I'm very happy to have close to 20 artists participating in this Resistance Show. Their resistance will be expressed through photography, printmaking, poetry, storytelling, illustration, and mixed media. Deb Hickey will be doing an installation on Fear and Hope with a room full of helium balloons (still working out the details). Carl Dimitri will be performing some percussion to accompany his projected illustrations of his Hello Mussolini drawings. His performance is scheduled for Saturday at 730pm and perhaps a Sunday performance at 1.30pm. 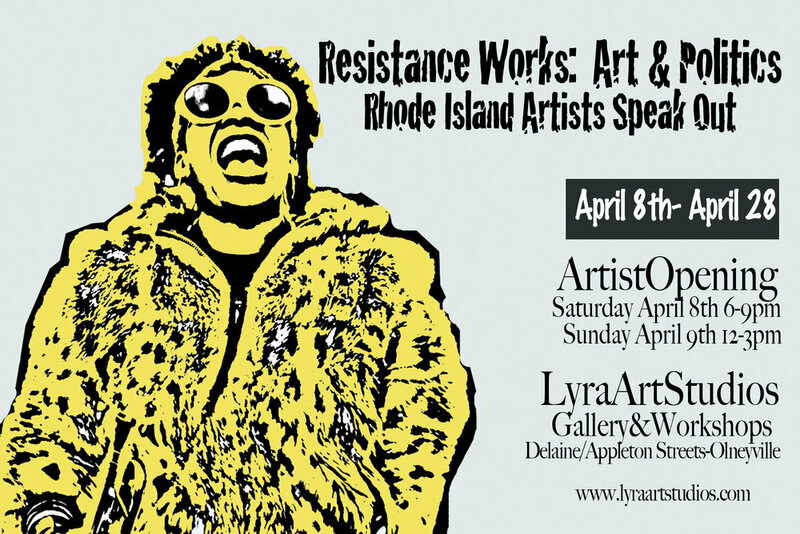 Rhode Island Black Storytellers (RIBS) will be working with participates to create Stories of Resistance. The Sunday Parlour Band will be playing some protest songs in the conference room on Sunday to give your ears a treat.